We are proud to announce that On Saturday May 14th 2016 K-ROD and Lost Entertainment will be in attendance at the Warp Zero Sci fi, toy show and art fair at Resistance Gallery Bethnal Green. We will be selling shirts, prints, clothing and maybe some toys. There will be EXCLUSIVE discounted science fiction art originals by K-ROD for that day only including canvas paintings and inked drawings. For more information please check out the event on face book by clicking this link. At last an international collectors 70's/80's Sci-Fi & Fantasy Toy fair, show and art market featuring sellers, collectors and custom toy makers from around the globe. 7 hours of buying, selling, sighing, swooning and haggling over some of the rarest and some of the most loved toys from 30-40 years ago! Featuring Micronauts, Shogun Warriors, Star Wars, Thundercats, Star Wars, Henshin Cyborg, Starcom, M.A.S.K, Centurions, Doctor Who, Go-Bots, Transformers, Voltron, Zoids, Mazinger Z, BattleStar Galactica, Rock Lords, Space 1999, Planet of the Apes, Dungeons & Dragons, Star Trek, He-Man MOTU, Godzilla, LOTR, Bionic Man, Mego, Takara, Palitoy, Mattel, Kenner, Ideal, Bandai, Remco, LJN, Hasbro, Matchbox, Tonka, Marx and many more! SCi-Fi themed cabaret club night after party too! Please contact Fred Yee if youre intrested in having a sellers spot. And share the event to those who need to know! 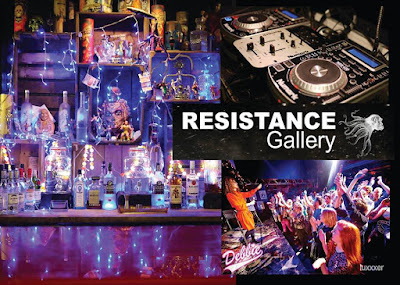 The Resistance gallery is a minutes walk away from Bethnal Green Station and is very easy to locate.